I've been looking for a lip balm for my boy that is safe and doesn’t contain many harmful ingredients. Actually, he demands using lip balm after seeing me using a lipstick or lip balm. Not only that last winter I've noticed that dry and cold weather made his lip dry and chapped lips. It is really difficult to find right products that are safe for toddlers. Finally, I'm happy that I received a set of three lip balms for my whole family (Mama, Papa, and Baby ) that is safe to use and is made of only natural ingredients. Hi! I am mamaearth's hypoallergenic petroleum base free non-toxic moisturizing lip balm. I have non-irritating all natural ingredients for infants as well as for parents with no additives and mineral oil. I have the buttery richness of cocoa butter and shea butter with Vitamin E moisturizes and protects dry, chapped lips against harsh weather. Coconut Oil, Olive Oil, and Calendula Oil in me nourishes and protects dry, chapped lips by restoring moisture. I am MadeSafe Certified and Dermatologically Tested with no paraffin wax, mineral oil, silicones, dyes, petrolatum, and SLS. I have been using this lip balm almost on a daily basis for the past two weeks. 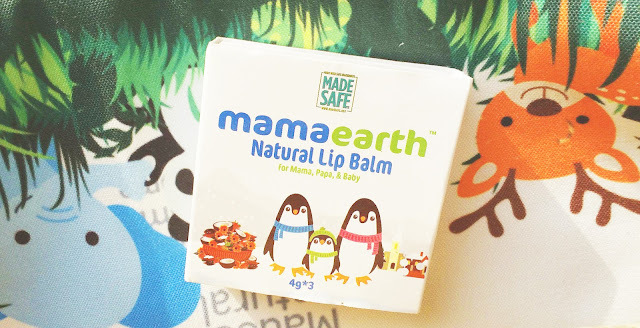 Mamaearth Natural Lip Balm is the moisturizing balm to leave lips feeling soft, smooth. It contains Coconut Oil, Cocoa Butter, Shea Butter, Beeswax, Calendula, Vitamin E, Olive Oil to lock in moisture, condition, nourish and protect the delicate skin on your lips and your babies lips too. All three lip balms have come in a usual twist up stick which looks really cute. Due to the tiny size, lip balms can be easily carried around in a bag. The texture of the three lip balm is smooth and creamy. The consistency of the mama lip balm is quite thicker than the other two lip balms and it gives you a bit heavy feeling during application. The other two lip balms are relatively light on the lips. 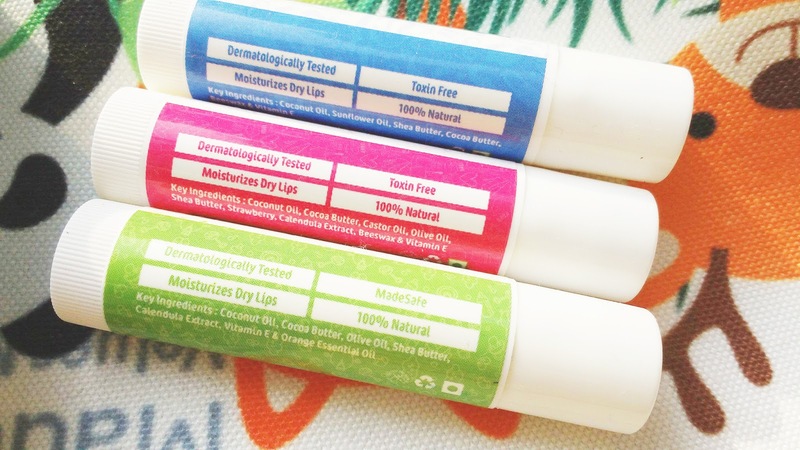 These are totally natural lip balms with no artificial color. Mamaearth Natural Lip Balm itself is white in color and goes on transparent on lips. This lip balm packed with Vitamin and natural oils like Coconut Oil, Sunflower Oil etc. Oils make the lips soft, smooth and supple. Some other hydrating and moisturizing properties like shea butter, cocoa butter protects lips by stimulating the healing process. Coconut Oil, castor oil and Strawberry are the main ingredients of this lip balm. Coconut oil makes the lips soft, smooth and supple where castor oil moisturizes, nourish the lips. Strawberry provides brightness to the lips. This lip balm enriched with Coconut oil, Olive oil, Calendula extract, Orange essential oil, Vitamin E. So you can imagine how safe it is for the kids. The most favorite thing about these lip balms that there is no artificial smell at all. It feels very natural on lips. These are the lip balms for dry lips. You can use it in winter and all other seasons if you feel dry lips. It is made of 100% natural and other natural skin moisturizing ingredients. These elements just keep the lips soft and smooth. These lip balms keep lips moisturized for 2-3 hours after fading away. Apply the balm as often as you need. Especially in cold, windy or dry weather; coat your lips with this Natural Lip Balm. 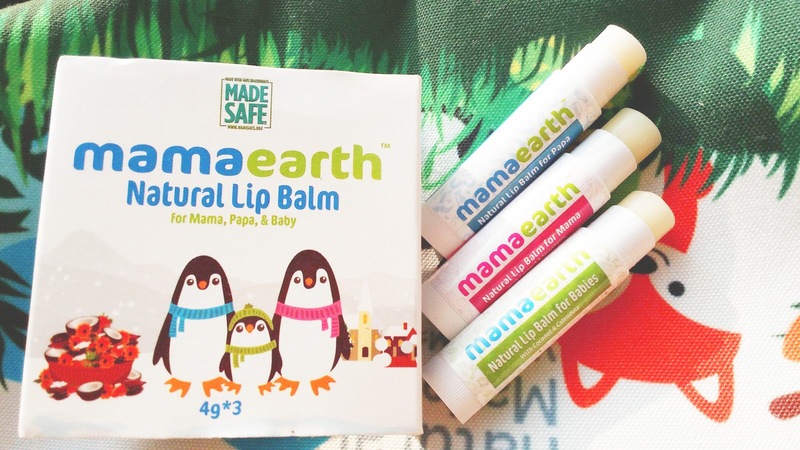 Overall Mamaearth Natural Lip Balm for Mama, Papa, and Baby are 100% Natural Lip Balm. These are lip balms for them who want simply healthy, moisturized, nourished, and supple lips in all seasons. I will tell you that if you want a lip balm for your family that you can use either in summer to keep your lips soft or in winter to protect your lips from drying or chapping out, you can easily pick up Mamaearth Natural Lip Balm for your family. Disclaimer: Product sent by brand but all opinions are my own. Good you checked the ingredients of the lip guard. Not many parents do that. Wow so cute to have one for each of the family member, in our case all three went to the little tornado!!! Mamaearth is the brand which i believe blindly... Me too using it awesome.. I am using so many products of Mamaearth and completely satisfied. I got the family pack lip balm and it is simply superb. I would recommend all. I love all the products of mamaearth. These lip balms also looks promising. Wow it's amazing that each one gets their own.. It's a must have product. 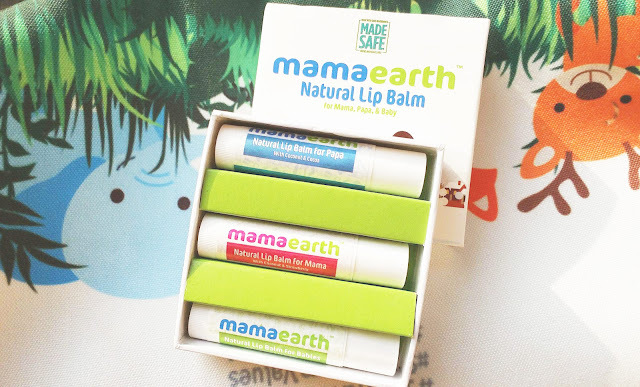 We love Mama Earth products from the starting.very excited to try this new launch lip balm set !